Some days are bow tie days, I don’t know how or why, but when you wake up, you just know. There’s also nothing quite like tying your own bow tie from scratch, and I mean nothing. You need to give yourself at least 30min extra to get ready in the morning because holy crap it’s a mission. Just take a look at the “how to guide” below. 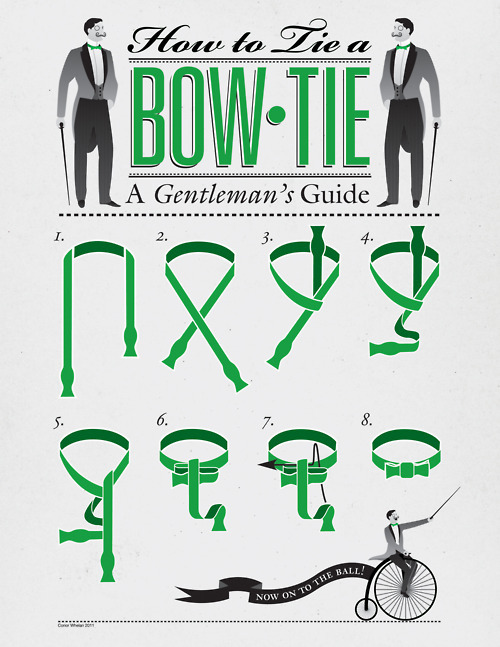 You will notice, how between step 6 and 7 nothing changes except for the introduction of a squiggly arrow, then Voila step 8, a perfect bow tie. It’s not that easy. I’ll be spending some time finding the best of the best tutorial out there and doing a post on How to tie a bow tie. Anyway, so this outfit made outfit of the week according to Instagram likes so here is the individual breakdown of every piece, if you have any questions, send them my way. The Blazer is from Topman, I picked it up in Kuala Lampur about 3 years ago, it’ a proper winter guy as its made from a wool blend, what sold me was the black piping around the edge. The V neck jersey was picked up on the final clearance rack at the Gap in London, it’s pretty basic so you should be able to find something similar anywhere. 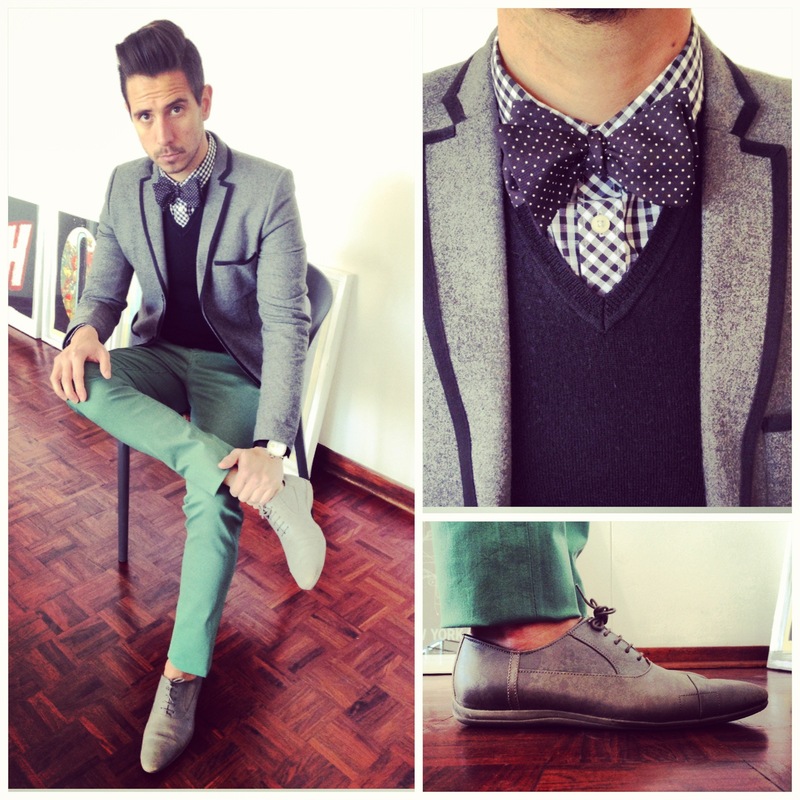 The shirt is from Ben Sherman, I’m currently a little obsessed with gingham, though the obsession has been growing over the last few years, though I struggle to find anything decent or well priced here in Joburg. My rule on shirts is that it has to have a button down collar otherwise it just looks messy when you wear it without a tie and the collar tips go everywhere. If you find any good gingham shirts, let me know please, I’m desperately seeking a green guy and a purple guy. The bow tie is from The Tie Rack in Lisbon, also a couple years back, it’s the first DIY bow tie I ever bought and at the time you couldn’t really find them here, you still really can’t I guess. Will let you know when I do. The pants are from Cotton On, they brought in a range of skinny chinos that were sold out in the first weekend they got to Sandton, probably because they fit so perfectly. I found myself going all the way to Clearwater mall in Roodeport just to get another pair. They’re pretty decently priced too. Finally the shoes, I picked up those at a Hugo Boss Outlet store on the outskirts of Lisbon, they were like triple reduced and so I snapped them up. I liked the casualness that the soles provided, meant they would be easy to wear with anything.